The giant white geodesic dome of Spaceship Earth is the most famous part image from Walt Disney World. Most people unfamiliar with the park, however, don't even realize that it is a ride, they just think it is something pretty. Inside the dome is a continuous-loading dark ride narrated by Judi Dench that presents the history of communication from the very beginning of recorded time. Using facial recognition software and interactive panels in individual ride vehicles the ride provides a customized final experience showing everybody their own vision of the future. Once out off of the ride, Siemens operates a large exhibit showcasing their technology through interactive games and exhibits. Location: Right in the middle of Future World, you must walk around it to get anywhere else in the park. Wait Times: Lines are generally longest in the morning when people are first entering the park. Consider waiting until later in the day when lines of 15 minutes are more common. Queue Description: None, you queue up an external ramp until you're inside the dome and board a ride unit. Ride Access: Wheelchair and ECV users should enter through the attraction's exit. Wheelchair Transfer: Wheelchair and ECV users will have to transfer into the ride vehicles. In case of evacuation of the ride, climbing many flights of stairs may be required; if this is not feasible wait for assistance. Audio: Ride narration is provided by speaker in your car and assistive listening devices are available at guest services. As a unique feature on this attraction, you can also individually select a language for your trip: English, French, German, Japanese, Portuguese and Spanish. Weight and Size Issues: Should be no issues. Other Issues: interior of the ride is generally dark and has several almost completely dark segments. The ride vehicles also moves backwards at some points and moves at significant angles as it moves up and down the track. At this location: Spaceship Earth and the ride inside has been here since day one, October 1, 1982. The Attraction's History: The ride itself is very similar to what was in place when the park opened, with a couple of updates over the years. In 1986, the ride closed for refurbishment and reopened with a new final scene (the current and near future of communication is always changing), a new theme song ("Tomorrow's Child"), and Walter Cronkite was added as the narrator. In 1994 another update was made, the song was removed (replaced with an instrumental theme) and actor Jeremy Irons replaced Walter Cronkite as the narrator. The biggest changes associated with Spaceship Earth have actually been in the post-show area. When the attraction first opened, riders exited into Earth Station, an elaborate version of each park's Guest Relations counter. Touchscreens could be used to make restaurant reservations or to find additional information about all the attractionns, stores, and restaraunts at Epcot. Overhead screens gave presentations on all the pavilions in Future World. This area was closed as part of the 1994 refurbishment of Spaceship Earth and reopened as AT&T's Global Neighborhood which, like an Innoventions exhibit, presented cutting edge communications technology from AT&T. When AT&T's sponsorhip lapsed in 2004 the area was walled off for a while and is now a mostly empty space. 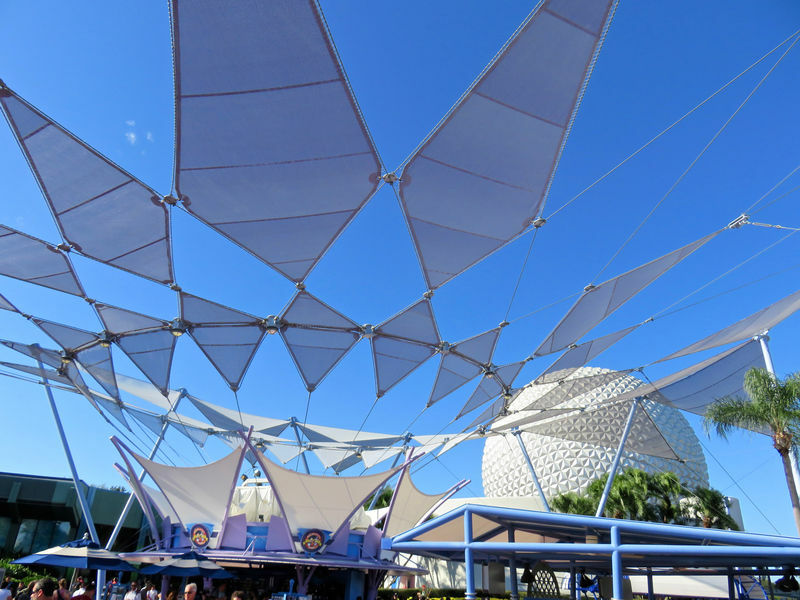 The exterior of Spaceship Earth has also undergone some transformations, changes which aren't like by many purists. As part of the Millenium Celebration in 1999 and 2000, a giant Mickey want with a "2000" sign was erected along the outer wall of Spaceship Earth. It was hoped by many that it would come down at the end of the celebration, but instead the "2000" part of the structure was changed to "Epcot" and it wasn't until late in 2007 that the giant arm finally went away. Also for the Millennium Celebration, Leave a Legacy monoliths were added on September 28, 1999, between Spaceship Earth and the park gates. Guests can pay to have an engraved image added to these granite walls. Sponsors: Bell Systems was the original sponsor but when that company was broken up by anti-trust lawsuits the sponsorship fell to the AT&T part of the fallout. AT&T continue the sponsorship through early 2004. In November 8, 2005, a 12-year sponsorship by Siemens AG was announced, and signs indicating the sponsorship were installed in May 2006. A new record, for a while: With the addition of the Mickey wand to Spaceship Earth, it became the tallest structure at Walt Disney World at 257 feet, beating The Twilight Zone Tower of Terror's 199 feet at Disney's Hollywood Studios. 199 feet had always be a de facto height limit at Walt Disney World since anything taller would require compliance with certain Federal Aviation Administration regulations. Once the hand came down in 2007, Spaceship Earth returned to its original height of 185 feet and the record went back to those previous title holders. A VIP Lounge: On the second floor there is a little-known VIP lounge for employees and guests of the sponsoring company. When Siemens took over sponsorship they renamed the lounge Base21.